Although wild birds are widely welcomed and liked, there are times when some kinds can cause problems, either posing a risk to public health and safety when excessive accumulations of droppings make paths slippery, or by spreading disease or contaminating food. Feral pigeons are a well-known nuisance in our towns and cities, but other birds can also bring their own troubles and as a result, the list of official “pest” species also includes two kinds of gull, the starling and the house sparrow. In the UK, the Wildlife and Countryside Act 1981 protects all birds, making it an offence to kill them or destroy their nest or eggs, though under certain circumstances, such action can lawfully be taken against these bird pests in the interests of preserving public health. Such measures are not, however, permitted simply to prevent damage to property or general nuisance problems – such as noise, smells or birds setting off burglar alarms – which can only be addressed by other, non-lethal forms of control. 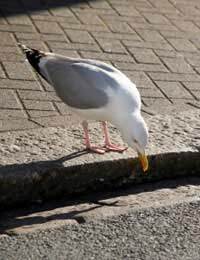 Herring Gulls – and to a smaller extent Lesser Black-Backed Gulls – commonly nest on rooftops in many coastal towns and may become aggressive when they have eggs or young to protect, often swooping at pedestrians or householders who stray too close. Aside of these unpleasant aerial attacks, nesting material and discarded food may block gutters, down-spouts and gas flues or encourage other pests, while severe fouling may occur around the area and along the parent birds’ flight-path. In addition, gulls are very vocal. With the number of pairs breeding on roofs in the UK increasing annually – at a rate of ten per cent per year for Herring Gulls and seventeen per cent for Lesser Black-Backed Gulls – this problem is likely to become far more common. Starlings commonly roost for the night in huge numbers in many urban areas, in trees, on buildings, or beneath bridges, often returning to the same place, night after night. The sheer volume of droppings which can accumulate from these large flocks can make pavements and walkways slippery and unsafe underfoot but may also cause severe damage to buildings and vegetation. Starling nuisance tends to become greater in the late autumn and winter, when migrating birds from northern and Eastern Europe join the resident population in their hordes. Generally a very welcome sight in the garden, house sparrows are less well received in supermarkets, bakeries and food manufacturing premises, where their activities can cause serious contamination of the product. Apart from droppings and nest material, they may also introduce other pest species into the building. The options open to suitably trained and licensed professionals are, inevitably, wider than those available to the general public and include shooting, poisoning, netting and trapping. However, in many cases householders themselves can take a number of effective steps to prevent or minimise the problem. A large build up of bird pests in urban areas usually indicates a ready food supply and suitable breeding spots – remove these and the problem largely abates. Though this approach can take a while to produce results and requires a degree of neighbourhood co-operation, it is probably the single most effective strategy in the long-term. Avoiding food spills, keeping waste secure and stopping the deliberate feeding of the pest species – which may require some modifications to bird tables and feeders – will all help to deny them an easy meal, which in turn reduces the numbers bred. In addition, anti-roosting devices can be installed on favoured sites to dissuade birds from using them. A variety of such tried and tested measures are routinely used, including tightly stretched netting, suspended trip wires and plastic or steel “spikes” – which are designed to deter the birds – not skewer them! Deterrence has been given a twenty-first century edge, however, with the development of electronic scarers which can be set to play a recording of the distress cries of the particular type of bird causing a problem. They are not cheap, but they are effective, using state-of-the-art microchip technology to fool the birds into believing that the area is dangerous, since they think they are hearing their flock-mates calling out a warning. The main advantage of this system is that it can be made highly specific, enabling the pest to be evicted, without scaring off harmless birds. What action can be taken against a neighbour who insists on feeding seagulls at any time of the day.we have contacted the council.they wrote a letter to them..it stopped for a short time.but has started again..it is making my husband and I both ill.we are both on antidepressants.. we get woken up at 4 every morning by the raucous seagulls. we have paid for nest removal and anti seagull deterrents on our joint chimney stack..the council suggested mediation.. if the neighbours were willing to talk then we obviously wouldn.t have contacted the council. we have not put washing out or been in the garden for over a year now.. COULD SOMEONE GIVE ME SOMME ADVICE PLEASE???? As you may well know, all species of gull are protected under the Wildlife and Countryside Act 1981 and the Wildlife (Northern Ireland) Order 1985 which makes it illegal to intentionally or, in Scotland and Northern Ireland, recklessly injure or kill any gull or damage or destroy an active nest or its contents. This means there is little you can do, especially if you live in a coastal area where gulls are located. If you have other neighbours that feel the same, perhaps you could come together in your complaint. Your only alternative option would be to suggest mediation given the council are powerless to do very much. Mediation just may work if you can help your neighbour see the damage that feeding such birds is causing. what action can be taken against a neighbour who insists on feeding seagulls at any time of the day........we have contacted the council......they wrote a letter to them..........it stopped for a short time........but has started again.........it is making my husband and i both ill.......we are both on antidepressants ......... we get woken up at 4 every morning by the raucous seagulls........ we have paid for nest removal and anti seagull deterrents on our joint chimney stack............the council suggested mediation ......... if the neighbours were willing to talk then we obviously wouldn.t have contacted the council....... we have not put washing out or been in the garden for over a year now............. COULD SOMEONE GIVE ME SOMME ADVICE PLEASE??? ?